Field tested activities. The games have been field tested in corporate training workshops around the world. They have been continuously improved on the basis of feedback from the players. Player and facilitator friendly. The participants rate these games high on the categories of relevance, flexibility, simplicity, efficiency, and intellectual stimulation. The facilitators are provided with step-by-step instructions for smoothly conducting the games. Easy to schedule. The games in this book can be played in as brief a period as 10 minutes. You can easily schedule a game to provide an experiential exercise before, during, or after your training session on a selected soft-skill topic. Any number can play. Each of the games can be played by three to seven players. Larger groups can be divided into smaller groups to play in a parallel fashion. Each of the 10 games in this book is a stand-alone activity. In addition, each game is a framegame template: You can remove the existing content of the game and plug in new content related to a different soft-skill topic. For example, the first game, Performance Chat, deals with improving human performance. This game is built upon a framegame called Discuss. You can use the structure of Discuss as a template to create training games on other soft-skill topics. 10 ready-to-use games. Each game is based on a different framegame. You can use the game without any modification to help the participants master a specific soft skill. 100 games. You can interchangeably use any soft skill topic with any of these games. For example, you can plug in the checklist for improving human performance inside any of the other nine games. Because you can use any of the 10 checklists with any of the 10 games, you have the equivalent of 100 different training activities. Since any of these checklists can be used with any of the 10 framegames, you have instant access to 260 training games. Unlimited number of games. You can create your own checklists on topics related to syour training needs. You can use your favorite framegame to design a training activity to help your participants master a new skill set. 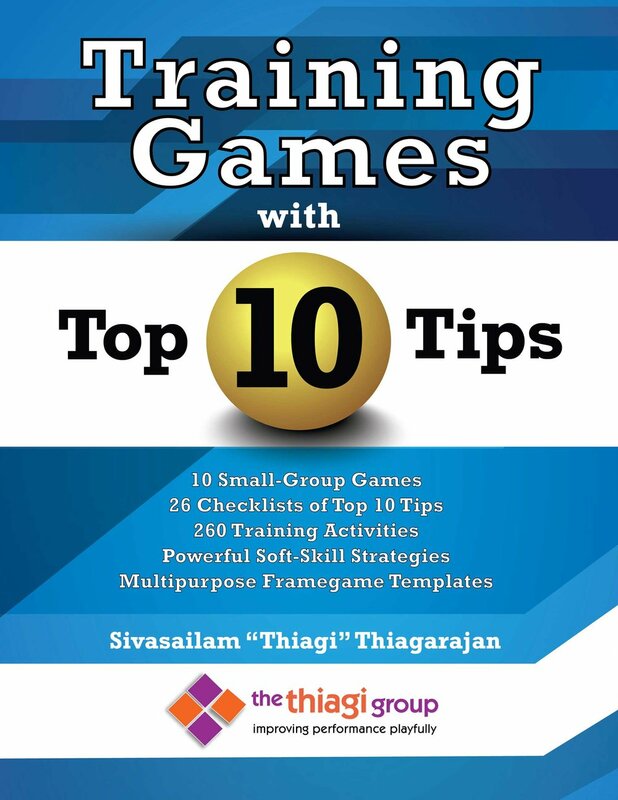 Play the games in the book and play with the structure of the games to expand your training tool kit. We plan to sell this book at $20 (plus shipping). Until the end of June 2018, we offer the book at a discounted price of $12 (plus shipping). This issue of the Gameltter includes detailed directions fore a game on improving personal productivity called One by One. Try out this game with a group of your participants to get a feel for these unique games. By the way, this game is not included in the book. It is a special bonus for the Gameletter readers.